In a small, fragrant room on the second floor of the Craft House, there is a perfume workshop held on weekends. Up a steep wooden staircase you enter a well-lit room, cooled with air-con, with two large wooden tables to sit around and more seating around the edge. On the tables are essential oil bottles of various scents, beakers, test tubes, paper strips, syringes, droppers, empty lip balm tins, as well as jars of oil and cocoa butter flakes. As time for the workshop to begin approaches, the room fills with mostly 20-something Vietnamese women, but there are a few men, typically accompanying their companions. After this engaging primer, Rei passes around test strips papers with scents applied and asks the group: What they smell? What color does it make you see? What about the texture? The shape? She encourages participants to think about the scent with all of their senses and, remarkably, people’s interpretations are quite similar. She does this with more test strips, again and again. After each round, she explains the significance of the smell, that the first one has notes of citrus, the second flower, the third wood and the fourth, oriental. Rei explains the uses of each of these notes to combine to create the best fragrance, like how flower scents are considered the heart of perfume, but that wood, specifically sandalwood, is the key ingredient in most men’s cologne, and how all of these groups can be combined to generate various attars; it just depends on the amounts and the combination. 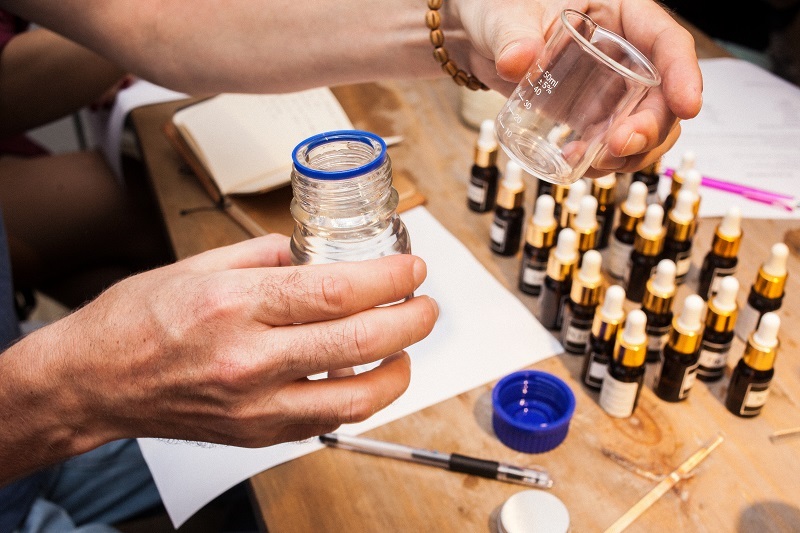 Once the participants have a foundation of understanding, they are given a paper with instructions for how to create what they refer to as a solid perfume, which is a natural scented balm or salve. The benefit of this over a liquid perfume is that liquid perfume has alcohol and other chemicals, whereas the salve is natural, using beeswax, coconut oil and essential oils, making this option better for the skin, more subtle and more unisex. 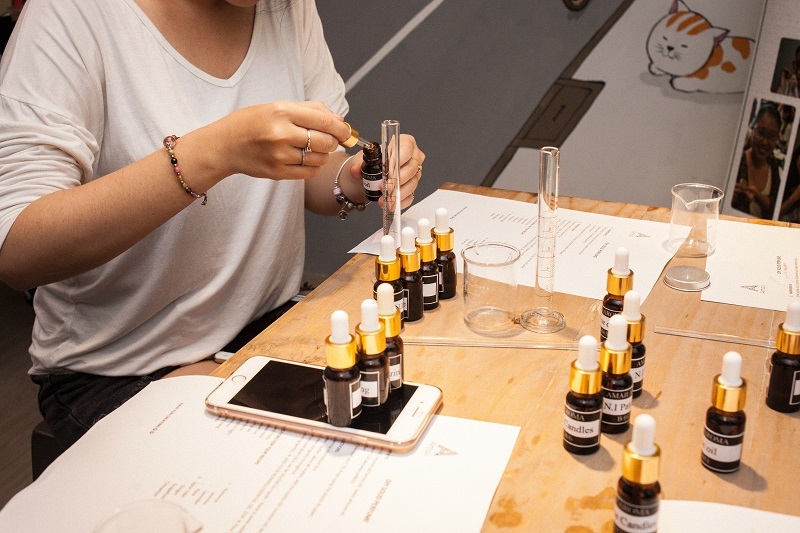 First, the participants smell the various essential oils and decide which scents they enjoy the most, typically choosing from just a couple to more than a half a dozen, being cognizant of how the combinations interact, or which scents overpower others. So, for example, if you use something like canela (cinnamon) with a flower scent like rose or lavender, then you’ll need more drops of the flower or it will be subdued by the stronger canela, like 3 or 4 drops of the flower scent to every one of canela. 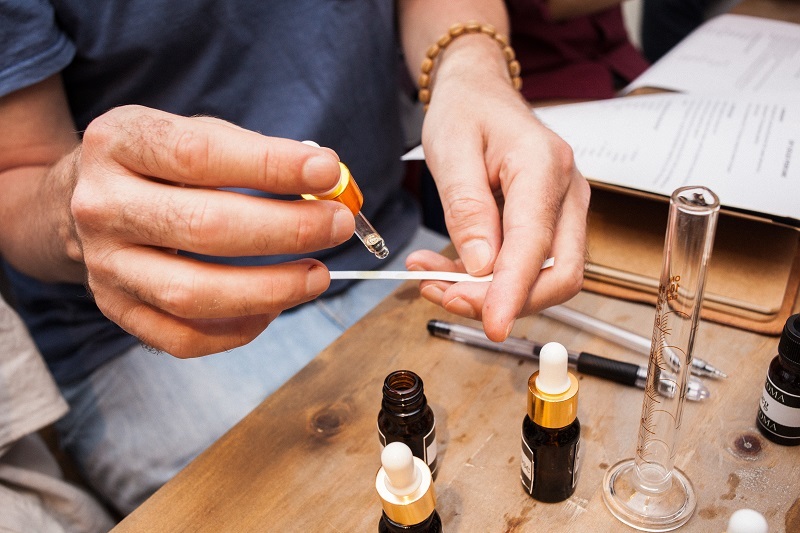 Once the participants decide on the essential oils they like and what ratios work best, which comes with a bit of trial and error, they count out the drops that get placed in a test tube until they have 2 milliliters, or approximately 76 drops. 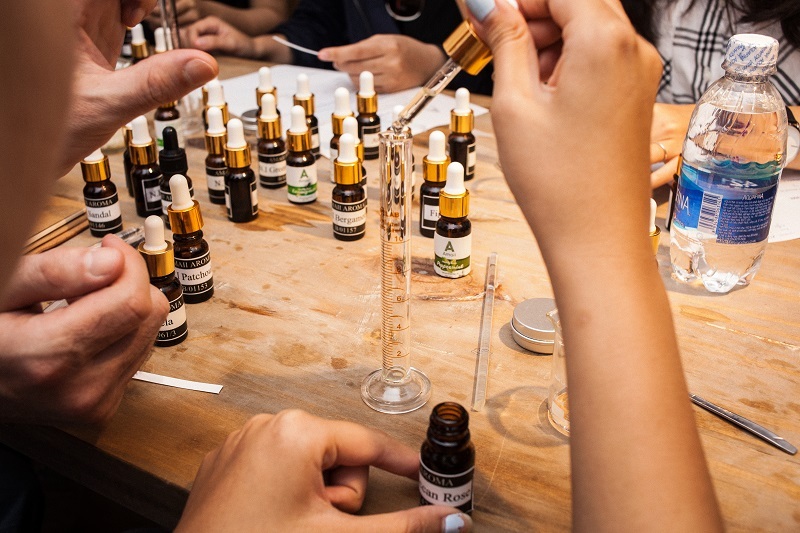 After that, the attendees pour ten milliliters of oil, either jojoba, coconut, kernel, or sweet almond oil, depending on their preference, into a beaker. They then weigh out 1.5 grams of beeswax pellets and one gram of shea butter on a small digital scale and add it to the oil in the beaker. Next, the mixture is heated and stirred until it is properly blended. It then needs to cool slightly before the essential oil mixture is added and is continually stirred and blended. Finally, before the mixture cools to the point of solidification, it is poured into one of the empty tins. And voila, you have your own personalized scent. Those in attendance seemed to really enjoy the experience and were more than satisfied leaving with their own unique fragrance. Furthermore, it cannot be understated how engaging and articulate Rei is with assisting the patrons as they work through the process. It’s a delightful and constructive way to spend two hours, and a great weekend activity for couples, singles or families alike. Rei’s Amaii Aroma organization holds a number of workshops in both Vietnam and Japan, covering a wide range of topics relating to fragrance, including workshops on solid perfumes, spray perfumes, perfumed candles, massage oils, reed diffusers, as well as DIY workshops for natural cosmetics and skin care products such as lip balms, bath salts and soaps. For more info, visit the Amaii Aroma Facebook page at www.facebook.com/Amaii.ya/.